Just this last weekend (14th/15th July 2012) I attended the annual WordCamp UK get together for the first time. This year it was in Edinburgh. Nearly 150 WordPress theme and plugin developers attended and the event was superb – I learned something at every session I attended. On the second day I gave a talk about WordPress and web accessibility – two things that I care strongly about. You can access my slides from WordPress and Web Accessibility: Why It’s Important on Slideshare. What follows is summary of what I covered. After a brief look at what web accessibility means my presentation looked at some statistics concerning the number of people with a variety of disabilities and impairments – attempting to show that web accessibility affects many more people than most people might imagine. My aim here was to highlight the business case for building accessible websites by rebutting a series of accessibility myths. I included some aspects of the legal requirement in the UK for websites to be accessible and mentioned the recent legal action taken by the RNIB against BMI Baby. I then talked about and demonstrated how some of the people with impairments might browse the web and the difficulties they encounter along the way. I covered accessibility options within browsers and assistive technology – both software and hardware based. Can WordPress be used to produce accessible websites? Given the WordPress audience I also discussed if it was possible (and easy) to create accessible websites using the WordPress framework. The answer to that question is “Yes” if theme and plugin developers provide the tools and content authors follow the rules. I covered a few simple techniques that everyone could implement in their sites and underlined the fact that every single accessibility step that developers and content authors take will help somebody. Theme Customizer screenshot – it’s not possible to use this functionality without a mouse. 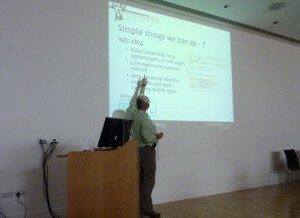 The final section of my talk covered the accessibility of the WordPress admin screens. Being the control area for a content managed website it’s no wonder that there is some complex functionality going on here. The accessibility of the back end screens is unfortunately poor as it has often not been thought about when the screens have been designed. Certain areas – especially the newer areas like the Custom Menu Builder and the brand new Theme Customizer for WordPress 3.4 are completely inaccessible to those who cannot use a mouse. I demonstrated some of these issues and made some suggestions as to how the screens could be improved. After I’d finished there were many questions from the floor, some great discussion and a real positive feeling from the audience. One discussion centred around the reporting of accessibility issues within WordPress on the development bug recording system (Trac). I was asked whether I’d raised tickets (bugs reports) for any of the issues – something I hadn’t actually done. Generally people thought that was important as the WortPress core developers would certainly not be able to fix issues if they weren’t aware of them. One of the participants actually raised a ticket on the Theme Customizer functionality there and then. Given the positive feedback on this point I will be raising more tickets to cover off each of the accessibility issues within the WordPress back end. I would also urge others to get involved in this process – either raising tickets themselves or commenting on existing ones. If you have ideas for solutions to some of the accessibility issues then I am assured these would definitely be welcomed by the developers as comments on tickets. With that in mind I’ve also published a beginners guide to Raising a WordPress Trac Ticket for Accessibility Issues – I hope it helps. Please feel free to leave any other comments to me below. Thanks. 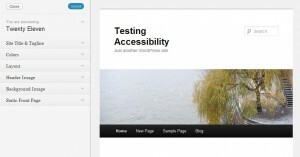 Next post: Work starting on WordPress 3.5 – Now is the time to raise those accessibility tickets.